This is a magnificent example of a No. 99 from the golden age of saw making. This 26" example is a 10 point cross cut with apple handle and brass hardware. 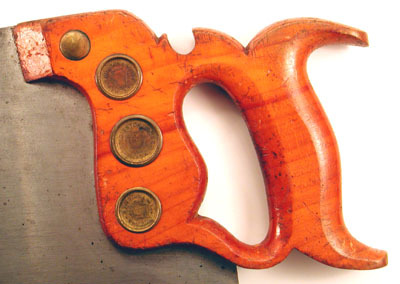 This saw has also been called the "Prize Medal Saw", owing no doubt to the three medallions used to fasten the handle to the blade. 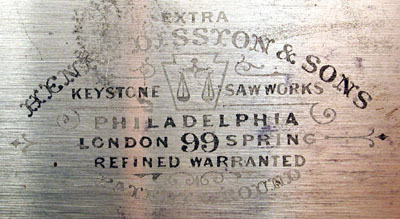 While the date of the first example of this saw has not been established, it has been recorded in catalogs going back to 1876. The No. 99 continued into the 20th Century, vanishing sometime between 1914 and 1918. A close up of the apple handle. Note that this saw, like the D8 has a let in handle. The saw screws bear the December 27, 1887 patent date for the Charles Glover Patent of the modern domed saw nut. These are also of the "sunken" type, where the handle has been bored out to accept the flat part of the medallion. A very good shot of an owner's applied etch. 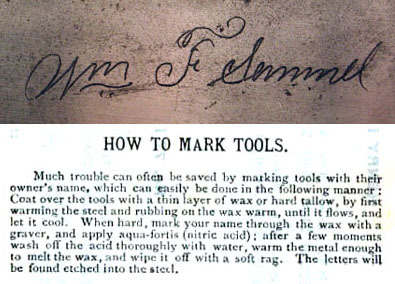 While researching this saw, I by chance caught a description in an old Disston catalog from 1887 which instructs how to apply an etch like this. Finally, a copy of the page from the catalog which is from the same year this saw was made. Note that the prices were for a dozen!